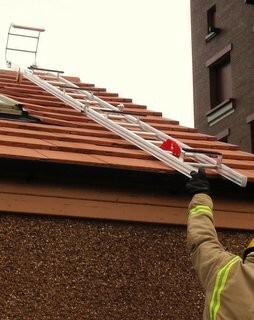 Roof Ladders, for Fire Service Use. Available in two main formats:- Single or Two piece. These are a single section to the stated length, with a folding hook at the head that locks in both the closes & open positions. These have two sections with locking hinge; that when locked into the open position form a single length. With a folding hook at the head that locks in both the closes & open positions. We have two standard widths of roof ladder: Narrow 290mm & Wide 350mm, should a client require a different width and size; we can supply them following approval of our drawings. For specification and warranty details, on main ladder page; "click here". All ladders are manufactured by our Austrian partners.